The Bourse took a turn and ended the week on a positive note as the ASPI increased by 17.19 points (or +0.31%) to close at 5,557.24 points, while the S&P SL20 Index also increased by 14.01 points (or +0.51%) to close at 2,738.95 points. JKH was the highest contributor to the week’s turnover value, contributing LKR 0.43Bn or 28.05% of total turnover value. Sampath Bank followed suit, accounting for 11.52% of turnover (value of LKR 0.18Bn) while Melstacorp contributed LKR 0.15Bn to account for 9.49% of the week’s turnover. Total turnover value amounted to LKR 1.53Bn (cf. last week’s value of LKR 1.91Bn), while daily average turnover value amounted to LKR 0.31Bn (-35.93% W-o-W) compared to last week’s average of LKR 0.48Bn. Market capitalization meanwhile, decreased by 0.61% W-o-W (or LKR 15.67Bn) to LKR 2,605.90Bn cf. 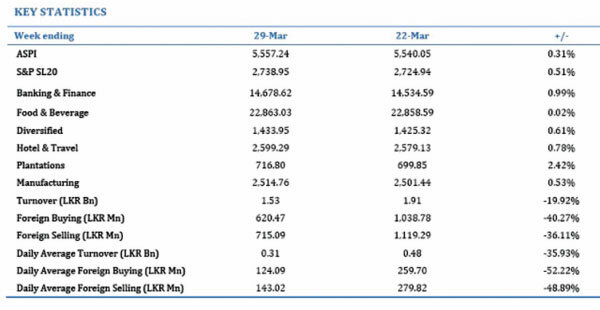 LKR 2,590.23Bn last week. The Diversified sector was the highest contributor to the week’s total turnover value, accounting for 44.62% (or LKR 0.68Bn) of market turnover. Sector turnover was driven primarily by JKH, Melstacorp & Hemas Holdings which accounted for 84.14% of the sector’s total turnover. The Banks, Finance & Insurance sector meanwhile accounted for 34.16% (or LKR 0.52Bn) of the total turnover value, with turnover driven primarily by Sampath Bank, Nations Trust, Commercial Bank & Union Bank which accounted for 69.60% of the sector turnover. The Beverage, Food & Tobacco sector was also amongst the top sectorial contributors, contributing 4.92%(or LKR 0.08) of the total turnover, where sector turnover was primarily driven by LMF & Lion Brewery which accounted for 77.88% of the sector turnover. The Banks,Finance & Insurance sector dominated the market in terms of share volume, accounting for 31.91% (or 15.52Mn shares) of total volume, with a value contribution of LKR 0.52Bn. The Diversified sector followed suit, adding 21.22% to total turnover volume as 10.32Mn shares were exchanged. The sector’s volume accounted for LKR 0.68Bn of total market turnover value. The Manufacturing sector meanwhile, contributed 4.57Mn shares (or 9.39%), amounting to LKR 0.07Bn. Top Gainers & Losers Blue Diamonds[NV] was the week’s highest price gainer; increasing 50.0% W-o-W from LKR0.20 to LKR0.30 while Bansei Resorts(+34.7% W-o-W), Chemanex (+26.9% W-o-W) and Nuwara Eliya (+25.0% W-o-W) were also amongst the top gainers. Office Equipment were the week’s highest price loser; declining 14.1% W-o-W to close at LKR70.0 while Regnis(-13.1% W-o-W), Namunukula (-12.9% W-o-W) and Kegalle(-12.0% W-o-W) were also amongst the top losers over the week. Sri Lankan equity markets reversed early losses during the week to close on a positive note as the ASPI recorded its highest daily gain in over 4-months (44.5 points or 0.8%) on Thursday. Selling pressure in blue-chips and telecom counters led the broad-share index to lose 28.3 points by Wednesday, subsequently closing at a new 6-year low of 5,511.77 on Wednesday. Strong buying interest primarily in heavy-weight and blue-chip counters returned on Thursday however as investors sought out undervalued stocks. Losses during the beginning of the week were reversed as heavy weight JKH gained 3.7% W-o-W and contributed 15.5 points to the index. The ASPI consequently snapped 7 straight weeks of losses, to record a weekly gain of 17.2 points or 0.3% W-o-W. Activity levels however continued to drop and remained dull throughout the week as average daily turnover levels for the week decreased to Rs. 0.31Bn from Rs. 0.48Bn last week (-35.9% W-o-W). 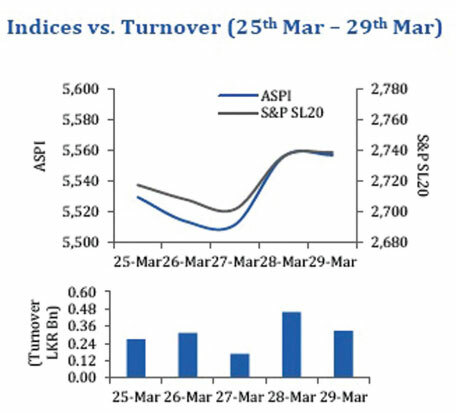 The daily average turnover for the week was the lowest in over 5-months and significantly lower than the YTD daily average turnover of Rs. 0.65Bn. Local HNI and Institutional investors remained staunchly on the sidelines this week as crossings for the week accounted for a mere 10% of the weekly turnover (cf. YTD average of 40%). Investor interest in blue chip Melstacorp meanwhile dominated this week’s crossing, accounting for 71% of total crossings as two large parcels were recorded on Thursday while NTB accounted for the remaining 29%. 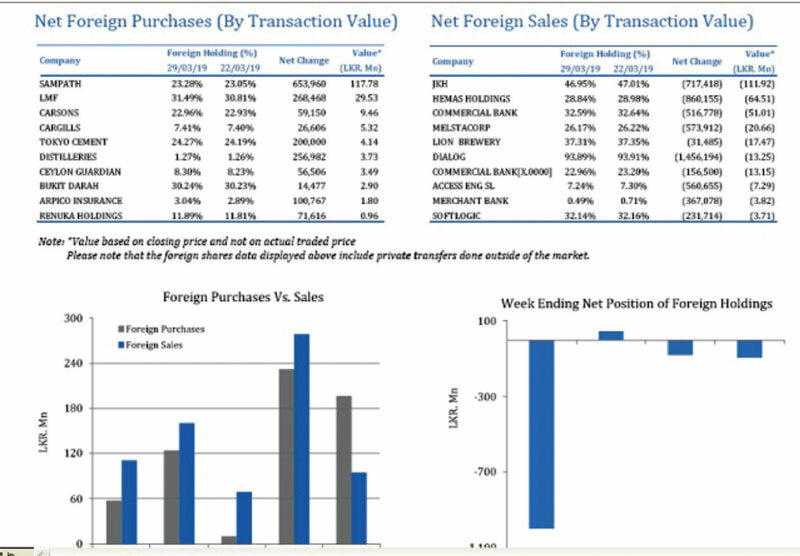 The foreign sell-off on the Colombo Bourse continued as foreign investors recorded a net foreign outflow of Rs.94.6Mn during the week cf. Rs. 80.5Mn net outflow last week. The majority of foreign selling was in blue-chips JKH, Hemas Holdings and Commercial Bank which were collected by key local HNIs, but foreign buying in Sampath Bank helped pare down the net selling on the market. Markets in the week ahead are likely to look for direction from political & economic developments ahead of the final vote on the 2019 Budget which is set to take place next Friday. Corporate earnings for the total market1 indicated a slowdown over the Dec’18 quarter relative to last December, as earnings fell 38% Y-o-Y to Rs. 62.4Bn (cf. Rs. 100.6Bn in Dec’17) amid declines in most sectors including the Financial Services sector which is the largest contributor to earnings (typically accounts for 40% of total market earnings). The Financial Services sector decline 50% Y-o-Y for the quarter as earnings from Banks fell 25% Y-o-Y as a result of the newly introduced debt repayment levy and the adoption of SLFRS 9 reporting standards which require higher impartment charges amid deteriorating asset quality in the industry. The decline in earnings of the Finance (-32% Y-o-Y) and Insurance subsectors (-69% Y-o-Y amid one-off adjustments stemming from the change in insurance industry valuation rules) also contributed to the drop in earnings. Weak earnings performance in sectors such as Manufacturing (-30% Y-o-Y), Telco (-73% Y-o-Y), Land & Property (-62% Y-o-Y), Motors (-108% Y-o-Y), Hotels (-29% Y-o-Y) and Healthcare (-9% Y-o-Y) also contributed to the decline in market earnings. Diversified (+5% Y-o-Y) and F&B (+18% Y-o-Y) sectors which typically account for ~26% - 29% of market earnings meanwhile were the only two sector that recorded an earnings growth for the quarter. Cumulative earnings2 for 9M to Dec’18 meanwhile also fell 2.8% Y-o-Y to Rs.172.9Bn (cf. Rs. 177.8Bn in 9M’18), due to lower corporate earnings in sectors such as Diversified Holdings (-20% Y-o-Y) and Manufacturing (-36% Y-o-Y). Nevertheless stronger corporate earnings in sector such as Financial Services (+26% Y-o-Y) and F&B (+12% Y-o-Y) supported cumulative market earnings. In terms of trailing 12M earnings, market earnings dipped 10% Y-o-Y to Rs. 265.2Bn as a result of declines in Financial Services (-7% Y-o-Y), Diversified (-2.0% Y-o-Y) and Manufacturing sectors (-40.0% Y-o-Y), reflecting the slowdown in overall GDP growth for 2018. Despite the drop in earnings, Sri Lanka’s market PER fell to 9.3x by the end of Dec’18 (cf. 10.4x in Dec’17) amid a 5.0% Y-o-Y drop in the index during 2018.